'Russet', the Elbridge Gerry Chadwick estate designed by James O'Connor c. 1921 in Muttontown. 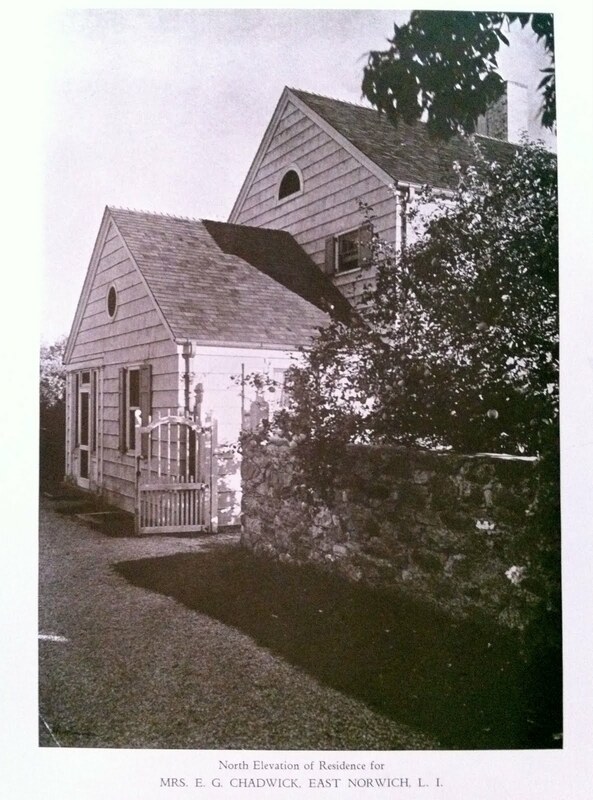 Chadwick was the vice-president of Brown-Wheelock, a real estate firm, and was at one time the manager of the Vincent Astor estate. Click HERE to see 'Russet' on google earth and HERE on bing. Photo from Selections From the Work of James O'Connor. Love that wallpaper in the dining room. I am on the same track as The Ancient. But surely it is a one-of-kind painted mural instead of wallpaper. The design is very bold for a residential dining room. It is probably a charming house; I would love to see the floor plan. The staircase is beautifully designed. It appears to me (and frustratingly, in blogger's new picture enlargement system, I can no longer blow the picture up on screen for a better look) to be a hand painted scenic paper, rather than a mural or a block printed scenic paper. I once owned such a set. Old Grey, I'm assuming the estimable Ancient is referring to the odd practice, foisted upon us by HGTV and an ever slicker real estate industry, of 'staging' a house for sale, by removing anything unique, odd, or personal, and painting everything beige, and getting those nasty antiques out of rooms and replacing them with more modern furniture to 'appeal to younger buyers'. If it was a mural, so much the better. "Neutralize" means a team of "design professionals" (and I use that term advisedly) come into your house and mark for death anything that might conceivably deter a potential buyer. 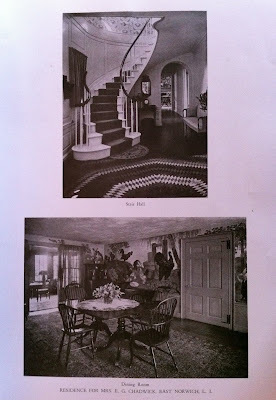 So, for example, if you have bright colors, marbleized walls, or wallpaper that wouldn't necessarily appeal to someone with money but no real sense of design, then those aspects of the house will stripped away -- even if, say, they might appeal to the likes of Min Hogg. 'su burban show house in Nebraska'---wish I'd thought of that one. If you click on the little white hyperlink at the bottom of the enlarged picture, you should still be able to get something like the old display. Then click on that, and simply scroll your mouse to enlarge further. P.S. I looked at the Madoff house. It's quite deracinated, isn't it? Nothing in the interior gives any sense of time or place. I am sure most people know (but in case some don't...)that if you press "Ctrl" and the "Plus" sign in the top row, right, the picture will enlarge and you can see details. You can really see everything close up. D.E.D., I was beginning to wonder if I was the only one who was appalled by the trend of horrible new chimneypieces! Granted, I am probably overly critical of such things, in general, but I could have never imagined such monstrosities that are now prominently featured in (supposedly) high style (but certainly big budgeted) interiors. The strange thing is the similarity that they all have. My decorator friends blame it on their colleagues' focusing on profitable elements rather than letting part of the budget going to architectural improvements. And Mr Chadwick had the good financial sense to march to the altar with a divorcée heiress to the Jordan Marsh mercantile fortune. (She was previously married to a nephew of Theodore Roosevelt.) Which seems to have resulted in enough money for them to purchase three adjoining plantations in South Carolina. I do think the dining room walls must sport a mural rather than a wallpaper. The pattern is a bit insane and far too personal that the usual chinoiserie-garden effect most people were after. I mean, really, chickens on steroids? I don't care for the fact that I can no longer enlarge the photos. An Aesthete's Lament thanks for the WL link for the Bruce estate. Agreed that its now devoid of a well-lived character by real owners. Off topic but when there was mention of Ms. Bruce I was reminded of the loss of her young daughter (Alexandra who went by Sasha) purportedly murdered in Virginia by her new Greek-born husband. Not a lot of happiness there. Ancient...thanks for the tip. The photos now enlarger better than before. Ancient, you are correct about the Evangeline Bruce house -- I believe the appropriate term DED & Magnus have used for similar houses is: WASP safe. Chadwick lived here after Dorothy's divorce from Monroe, but Monroe Robinson and Dorothy May Jordan were married in 1921 when the house was built. Correct?